Advent – my favorite time of the year! What is there not to love about Advent? My husband and I read Advent stories to the boys, the boys read Advent stories to me and my husband and, sometimes, the boys read Advent stories to one another. No matter who is reading, no matter what activity we are engaged in, the focus remains on Christ. I also enjoy my personal Advent time reflecting on God’s amazing love while reading my Bible. 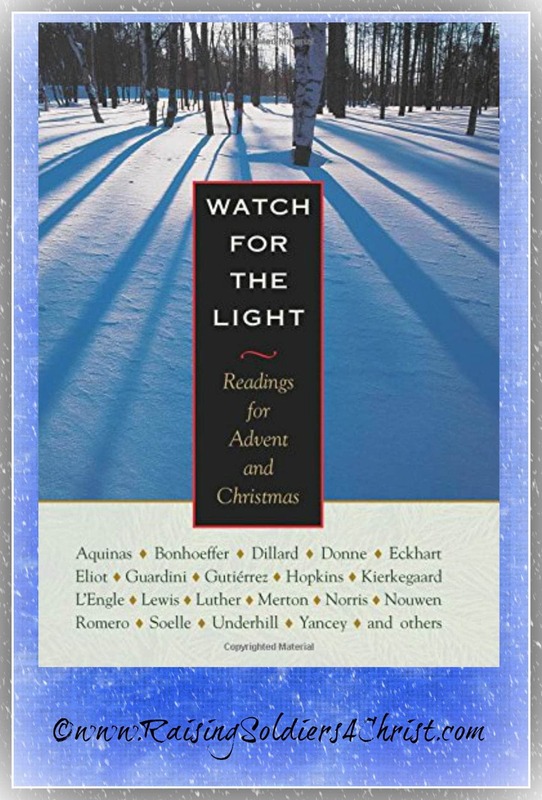 One of my favorite books I read from in addition to my Bible is Watch For the Light: Readings for Advent and Christmas. Though Christians throughout the world make yearly preparations for Lent, there’s a conspicuous lack of good books for that other great spiritual season: Advent. However, this four-week period leading up to Christmas is making a comeback as growing numbers reject shopping-mall frenzy and examine the deeper meaning of the season. Ecumenical in scope, these fifty devotions invite the reader to contemplate the great themes of Christmas and the significance that the coming of Jesus has for each of us – not only during Advent, but every day. Whether dipped into at leisure or used on a daily basis, “Watch for the Light” gives the phrase “holiday preparations” new depth and meaning. Included are writings by Christoph Friedrich Blumhardt, Sylvia Plath, J. B. Phillips, Friedrich Wilhelm Foerster, Henri Nouwen, Bernard of Clairvaux, Kathleen Norris, Meister Eckhart, St. Thomas Aquinas, Karl Rahner, Isaac Penington, Madeleine L’Engle, Alfred Delp, Loretta Ross-Gotta, William Stringfellow, J. Heinrich Arnold, Edith Stein, Philip Britts, Jane Kenyon, John Howard Yoder, Emmy Arnold, Karl Barth, Oscar Romero, William Willimon, Johann Christoph Arnold, Gail Godwin, Leonardo Boff, G. M. Hopkins, Evelyn Underhill, Dorothy Day, Brennan Manning, Dietrich Bonhoeffer, Romano Guardini, Annie Dillard, Martin Luther, St. John Chrysostom, Giovanni Papini, Dorothee Soelle, C. S. Lewis, Gustavo Gutiérrez, Philip Yancey, J. T. Clement, Thomas Merton, Eberhard Arnold, Ernesto Cardenal, T. S. Eliot, John Donne, Gian Carlo Menotti and Jürgen Moltmann. This book is absolutely extraordinary! It is filled with wonderful pieces of literature works, all compiled into a very easy to read Advent study. There is a reading each day starting on November 24 and ending January 7th. I particularly appreciate the fact the readings begin before December 1st. I don’t know about you, but reading during Thanksgiving week seems to prepare me for the Christmas season with Christ at the forefront. It also builds my anticipation and excitement for Advent —-the coming of Christ. With the commercialization and political correctness of Christmas season on the rise, it is so important for us to take time to pause and reflect on the true meaning of the season. One difference I noticed with this “devotional” that makes it unique from others is the fullness of the entire devotional. When I speak of fullness, I don’t mean to sound like I’m degrading other devotionals because I’m not. I have read some pretty amazing devotionals. But, what I mean by fullness is many other devotionals have left me hanging and craving for more. Many seem to abruptly come to an end, yet I’m looking for more in the devotional that I can chew on and help carry me throughout the rest of my day. Watch For the Light: Readings for Advent and Christmas fills my spiritual gas tank and lasts throughout the rest of the day. I’m not left with a void or a hunger that I had with many other devotionals. The readings are superb and leave me feeling content as I reflect on God’s awesome love for me. They also are not overwhelming. I dare to say that it is a perfect balance! With all the children’s Advent studies and Christmas books we read throughout the season, this is a breath of fresh air for parents. However, this isn’t a book just for parents! It is for any adult that wants to seek a closer relationship with Christ, especially during the hustle and bustle of this season. I recommend this for anyone!!! I give this book a 5/5! Previous Post: « On The Second Day Of Christmas My True Love Gave to Me…..